Hello world, it’s Friday, May 19th and this week was special for Android lovers and developers who build on top of Google’s platform. Yes, you guessed it right, this week Google kicked off their annual conference, Google I/O at the Shoreline Amphitheatre. The search giant made a lot of interesting announcements at the conference and we’re here to cover every single one of it. Welcome to the Weekly Tech News: Google I/O 2017 edition. This is exclusive roundup covers everything announced at the conference which includes the launch of Google Lens, new features coming to Google Photos, Android getting big performance improvements, Kotlin becomes the official language for Android Development and Google Assistant coming to iOS. Remember Google Googles? The funky app that used to give you results for images you searched for? The one which hasn’t been updated in years? It’s okay if you don’t remember it. This week Google took the wraps off a more mature version of the same technology. It’s called Google Lens and it’s built into the Google Assistant. What would it do you ask? 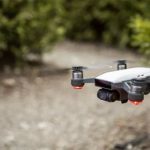 It’s basically going to be aware of your surroundings and provide a contextual feedback of what your phone’s camera sees. It’s so advanced that if you scan a Wi-Fi network code it will automatically connect you told it. Google Lens will provide you a visual search experience like never before. From scanning buildings to tell what’s around them, to scanning a business card and getting the phone number out, the Lens is by far the most advanced visual search tool that’s out there. 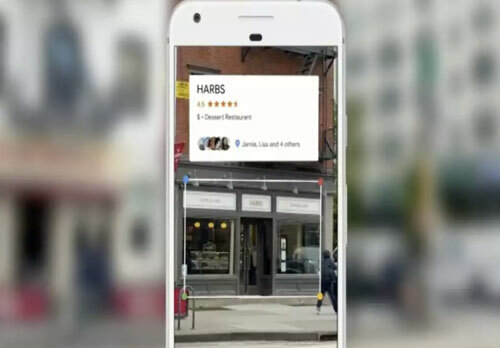 You’ll see a restaurant’s rating when pointing your phone at the storefront, you can aim it at a flower and it will identify the species, and you can even pull up a band’s music or videos by pointing Lens at a concert poster. Google is definitely not the first time a company has tried visual search Samsung has recently launched a similar service with Bixby vision but Google has a better shot at making it work just because of the sheer amount of data it has in its catalog. Google launched photos as a separate app about 2 years ago and not only did it revolutionize the photos segment by offering unlimited backup, it also beat everyone at the game by glazing the service with AI on top. The app not only categorizes your pictures but also groups them according to moments. 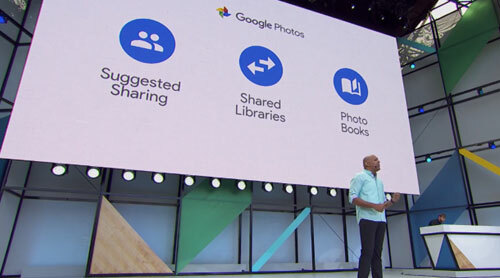 During their annual developer conference, Google announced 3 new features coming to Photos, namely Suggested Sharing, Shared Libraries, and Photo books. Let’s take a look at each of them one by one. Google Photos, doesn’t know who your friends are, and it doesn’t ask. Instead, it makes a series of clever educated guesses. If you send pictures of the same face to the same phone number or email address a few times, Photos will suggest you share your next few photos of that face with that phone number or email address. If your friend is a Photos user, they can save your photos to their own cloud library with a single tap – and if they have photos from the same event, they can share their own photos right back to you. You can also opt-in to a feature that makes your own face recognizable to Google in your friends’ photos. This feature is called Suggested Sharing. Shared directory is a feature for couples. If you have kids and a wife that you constantly take pictures of, it makes a lot of sense to automate the sharing process so that you both don’t miss out on those precious moments or have to wait around for the other person to share their collections. You can choose to share your entire library if you like, or only share photos of certain people — those kids, for example. You can also choose to share photos only after a certain date — the day you met your partner, for example, so as to spare them the burden of reliving your past relationships.Once your partner accepts your invitation, they will see whatever photos you’ve authorizes them to see, updated in real time. They can save them to their own libraries if they like with one tap. Over time, the team said, they might let you grant multiple people access to your library – so aunts and uncles and grandmas and grandpas all get access to photos of a new baby, for example. Google Photos’ third big announcement at I/O is a moneymaker: photo books. Nearly every photo service on the internet offers some form of photo books, and while each company brags about the quality of their own offering, in my experience they are all basically the same. What they have in common is that they make pretty good gifts, and they offer enormous profit margins to their makers. Google Photos’ photo books are no exception. You can make one on your phone or on the web, starting at $10 for a softcover 7-inch square book and $20 for a 9-inch hardcover book. In both cases, that cost covers only the first 20 pages – which isn’t a ton of photos, particularly if you’ve just taken a big vacation. Each additional page is $0.35 to $0.65. Google followed their tradition from last year and shipped the earliest preview of Android O way before Google I/O but they made major announcements about the new iteration during their keynote. With Android O the search giant is focusing on performance and stability instead of bells and whistles. Android O will soon include features under the banner Vitals, including security tools, OS optimizations and tools for developers to better suite your device usage. At Google I/O 2017, the Android team announced Google Play Protect, think of it as a virus scanner for Android apps. So far, the team reports having scanned over 50 billion app installs every day. You’ll see an entry in your Google Play app update window, showing your most recent scan and if there were any issues found. You won’t see these as features on your Android O device, but you will enjoy the improved battery life and security optimizations in the OS have the team reporting that Pixel devices are booting up in nearly half the time as before. This speed bump goes for apps as well. In Android O, highlighting text includes further features, using Google AI to intelligently act on the words. For instance, if you highlight a phone number, you can just tap to dial. If you highlight an address, a single tap will start navigation. Best of all, highlighting is more intelligent itself, selecting phrases or full addresses, for example, instead of just single words. Many custom Launcher users already know the power of a notification icon on top of an app icon on your Homescreen. We even used Tasker to build our own once, but now Google is building it into Android. Android O users will see a small dot that appears over top of their app icons with active notifications. This is where the magic starts, now that your app has an icon, new tools are available – Long-press the app icon with Notification Dot to get a short list of immediate shortlink actions you can perform. This includes viewing the notification itself right there in a tiny pop-up window. If you are an Android Developer like me, you would have dabbed your hands dirty with the age old Java and might have had multiple WTF moments due to the baggage that comes with a language that has aged so much. 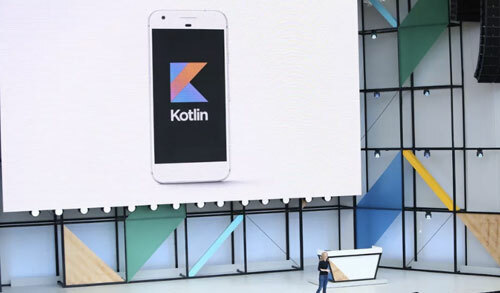 Well if you are pulling your hair out, you can stop because Google has just announced support for Kotlin as a first class language for Android. Kotlin is a super new programming language built by JetBrains, which also coincidentally develops the JetBrains IDE that Android Studio — Google’s official developer tool – is based on. Like Java, which is the default language for Android development, Kotlin is a language that runs on the JVM (Java Virtual Machine), and it’s already possible to use Kotlin and many other JVM languages for Android development. Android doesn’t use the JVM exactly, but the Java roots are strong, and Kotlin’s interoperability with Java have made it a popular choice for developers. Official Google support will be a huge boost for the nascent language, however, and will presumably make working with Kotlin on Android a lot more natural. 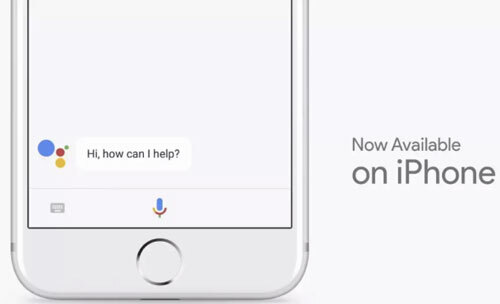 People living in the Apple ecosystem generally don’t get much love from Google but this week that changed when Google announced its plan to bring the Assistant to the iPhone. The company will roll out Assistant as a separate iOS app from Google search to specifically target tasks tied to your personal preferences. However, Assistant won’t be able to operate exactly like it does on Android devices. Google says because there are API restrictions, Google Assistant on iOS will only be able to do general stuff like send iMessages and play a song on your Spotify app, but not set alarms. Yeah, bummer. And since you can’t remap the Home button from Siri to Google Assistant, you can instead add a widget which looks like a big ol’ icon. I think all updates from Google are great and I love it especially for Android O.